The internal reflector lamp is one of the most widely used lamps found in vintage movie film projectors. Some of the best quality 8mm and Super8 projectors ever made, especially those by Bell & Howell used internal reflector lamps. The last few years the DLD-DFZ lamp has become increasingly hard to get, and the prices have skyrocketed. We have come up with a much more reliable, over-all lower cost solution. The Custom Plug In Module. Patent Pending. Replace that burnt out 15 Hour rated incondescent DLD-DFZwith our Halogen Plug-In Replacement Module!!! These custom plug-in modules are individually made by hand using the highest quality materials and components. Built to last, they are tested multiple times before passing inspection. If this module fails for any reason within 60 days from purchase we will replace it for free. If lamp fails after 60 day warranty, we will fix it for half the original cost. This module will fit on all model applications listed below, but if you're not sure, just email us. Compare with DLD-DFZ lamp prices and you can see the savings are significant! This way too, you can keep using the old family projector! This lamp is the same wattage(80) and voltage(30) as the DFZ-DLD so it is fully compatible. The MR16 type lamp is less expensive to produce than the decades older designed DFZ-DLD with its internal reflector. It last longer too, because it cools better, and has better shock resistance, making it more reliable. 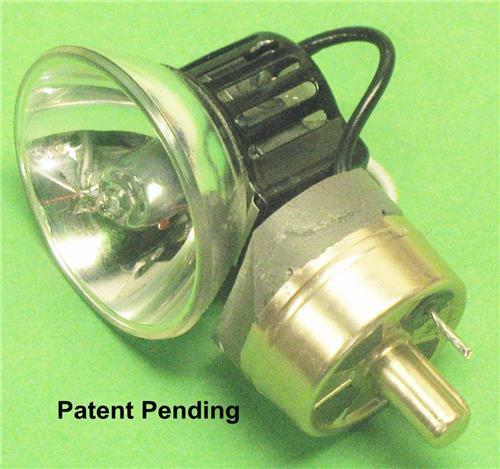 In fact, the MR16 halogen lamps are widely used in todays latest video projector models.